The application is open until January 10, 2017. The synergy between Physics and Geometry brought about by the geometric formulation of gravitational theories has inspired generations of physicists and mathematicians to collaborate in an increasingly sophisticated array of models of our universe. One such class of models comes from supergravity: a four-decade-old extensions of General Relativity, still very much studied today as limits of superstring and M-theories. These theories motivate a number of natural geometric problems, two of which shall be the focus of the Topical Workshop. The first problem is the classification of supersymmetric supergravity. This problem is now essentially solved for theories with at most 16 supercharges, but remains largely open for theories such as eleven-dimensional and ten-dimensional type II supergravities. Recent progress in a number of directions now make the classification problem in these theories tantalizingly in reach. Another problem is the investigation of moduli spaces of special geometric structures. 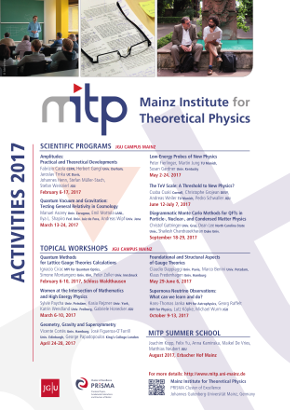 The aim of the Topical Workshop is to bring together leading researchers interested in supergravity and related geometric structures, to foster the exchange of ideas and to make progress in a number of timely problems, whose eventual solutions would not only close important and vast chapter in the study of supergravity backgrounds, but also lead to new insights into the structure of those theories and their application to holography and to phenomenology.